Wembley's 90,000 capacity makes it the second largest stadium in Europe (after Camp Nou) and the largest and tallest for size, in the world, with every seat under cover. It is one of the most expensive stadia ever built, costing close to £800 million. The land has been used for football since as early as the 1880s. The previous Wembley Stadium (originally known as the Empire Stadium) was one of the world's most famous football grounds, being England's national home for football, and, because of the geographical origins of the game, was often referred to as "The Home of Football". 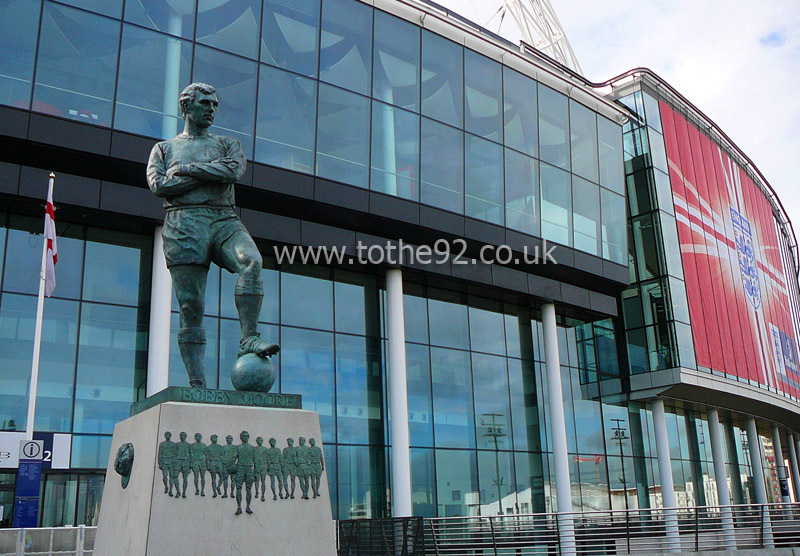 Though the original structure was closed in 2000, it was not demolished until 2003, after which construction began on the new stadium, originally intended to open in 2006. This was later delayed until early 2007. The final completion date of the stadium was 9 March 2007. 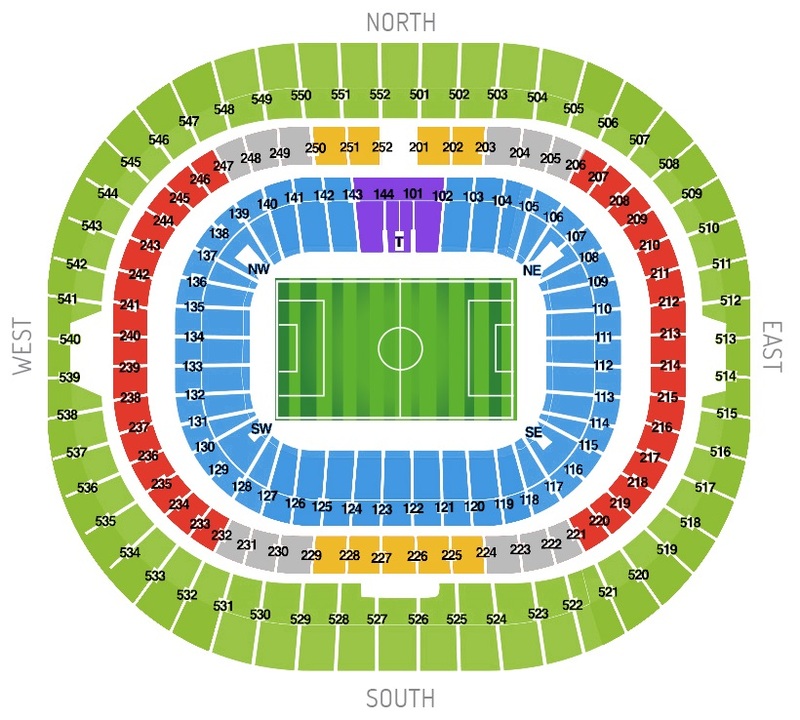 Visiting supporters are advised that there are no bad seats in the entire stadium. The middle tier is at the best level but as such its also the most expensive and therefore, most of these are sold to corporates. The back of the lower tier and front of the upper tier are considered the best places to be as you'll more than likely be in amongst the 'real' supporters and the view is still superb. There's also a selection of pubs near to the stadium, with the Greyhound and a selection of others on Harrow Road, south of Wembley Stadium Station. Wetherspoon’s JJ Moons and Eddies (which comes highly recommended compared to the other pubs in the area!) are on High Road, between Wembley Central Station and the stadium but another option is the green man pub although you'll have to climb a rather steep hill on the east side of the stadium to find it. It's situated just off Dagmar avenue opposite stadium way. Wembley Park Station has a McDonalds and Wimpy as well as several chicken and pizza places on Wembley Park Drive. Wembley Central has KFC, McDonalds, Burger King and a Wok’s Cooking all situated on High Road on the walk up to the ground. There's also a couple outside Wembley Stadium station. All are within a mile of the ground and for the difference in price compared to what you'll find inside, make it well worth the effort. Parking is as much of a nightmare here as I've found at any other stadium on my travels as street parking is simply non existent. For that reason, since my very first visit back in the early 90's I've taken the train. If coming from a distance, a lot of fans tend to park at one of the stations on the outskirts of north London and get the tube down. This really isn't a bad idea and it guarantees avoiding match day traffic after the game as well. However, there are a few private car parks in the neighbouring streets though you'll need to be prepared to pay up to £12 per vehicle. 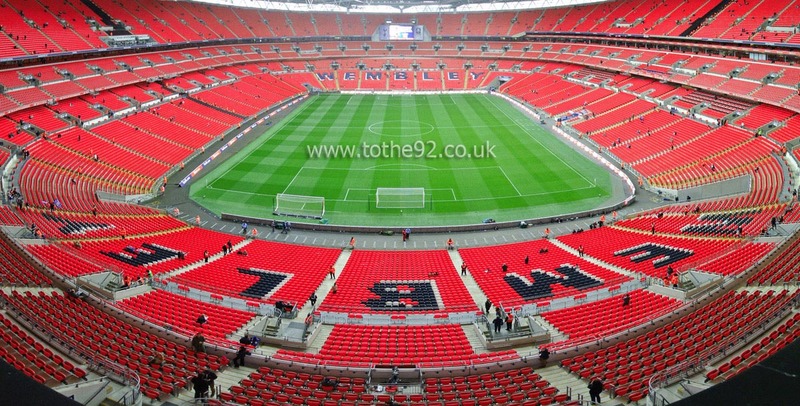 The nearest / closest train / tube station to Wembley Stadium is Wembley Park. The station serves Olympic Way, Club Wembley entrances and northern entrances E – K and lies on both the Jubilee (Grey) and Metropolitan (Purple) line. The main interchange stations are Waterloo and London Bridge on the Jubilee Line and Liverpool Street and Kings Cross St Pancras on the Metropolitan Line. The journey takes 26 – 32 minutes from those stations with the exception of Kings Cross which only takes 18 – 23 minutes. Services run regularly with additional services on event days which means you shouldn't have to wait any longer than 10 minutes for a train. From the station, lifts take passengers from platform level to the ticket hall. Cross the ticket hall to enter the lifts which will bring you down to Olympic Way. From there, it's approximately 600 metres to the Stadium. Alternatively, Brent Community Transport are operating a shuttle bus service on major event days from Wembley Park to the Stadium. Travel: Drove down and parked at Stanmore station and got the tube to Wembley Park from there. The car park is quite big, reasonably priced (£2 all day on bank holiday) and really easy to get to coming from the north as it is about 5 mins from J4 on M1 but it did fill up quickly. I arrived early (9am for a 3pm kick off) and the remaining spaces were in the single figures. I think there is street parking in the vicinity but may be 10/15 mins walk. 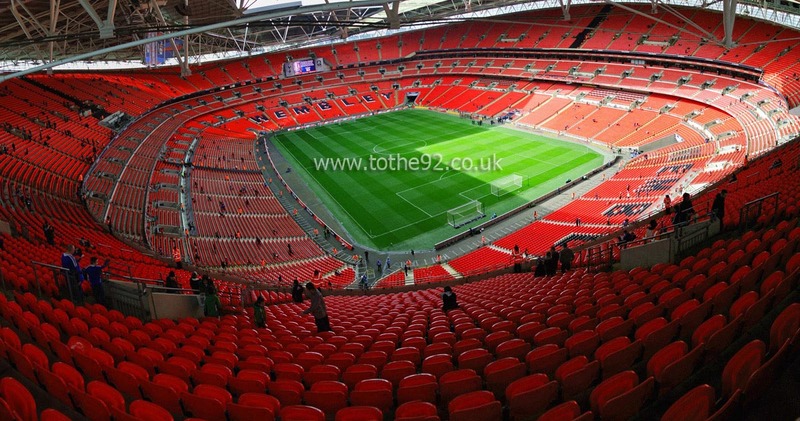 Once you are on the tube the Jubilee line takes you to Wembley Park in 10 mins and the stadium is a short walk from there. Refreshments: The police allocated a number of pubs to both sets of fans for this game and I presume that's the same for all other finals. I went to JJ Spoons which is towards central Wembley which was pretty good. £8 for a 4 pint pitcher of any lager was a great deal if there was a group of you. Impressions: The stadium is just as impressive as I thought it would be and walking in from Wembley Park towards the arch is a great experience. The atmosphere in and around the stadium was fantastic and the layout has been set up well to maximise that. Facilities: Once inside the ground the facilities are top drawer as you would expect. Prices for food and drink are, perhaps expectedly, a bit steep. Exit: I found it surprisingly easy to get away both from the stadium to the tube and getting out of Stanmore and back onto the motorway which is a blessing when the result doesn't go your way! Enjoy: It's difficult to fully enjoy your day when you get beat in a final and play poorly but aside from that it was a top day and would recommend anyone to go and watch your team play there if you get the chance. It will be worth any lengthy queuing either outside the ticket office or in the online format. Travel: Brilliant. London's Tube network means it's never a problem getting around, and Wembley Park Station takes you out right on Wembley Way. Refreshments: Retail Park down the street, and a few bars and takeaways, typical London really. The Tube also means you can obviously go a bit further afield and never struggle to find a pub. Impressions: I've always said Wembley is about the occasion rather than the game or the surroundings and it didn't disappoint. Perfect views all around, stunning atmosphere from us, the concourses are ridiculously huge, just… impressive. Atmosphere: I don't have a clue what United fans were like because we were unbelievable. The Club Wembley tier has of course had a lot of criticism for ruining the atmosphere, but that was never going to be a problem in this game. The Final in 2009 was good as well, but surprisingly the 2012 semi final was pretty subdued by both sets of fans. You would have expected more with it being a Derby and all that, but it seemed nerves got the better of both of us, I don't know. Was absolutely bouncing after Jelavic gave us the lead understandably though! Enjoy: Awesome absolutely fitting of all my expectations. Have you been to Wembley Stadium? To tell us about your experiences and to feature on the site, simply complete the fans review form below!